The weed was found in December 2018 in the Balingup area, in the South West of Western Australia but has not previously been recorded in Western Australia. A surveillance and eradication program is underway. This plant - seeds, berries and leaves - is toxic to both humans and livestock and can contaminate agricultural produce. Pokeweed (Phytolacca americana) has recently been found in the Balingup area. This is a new weed for Western Australia. A collaborative program to eradicate this weed is now underway with government and industry working together. The aim is to control all pokeweed plants prior to them setting seed this summer. We are asking all members of the local community to be on the lookout for this weed, and report any suspected sightings. 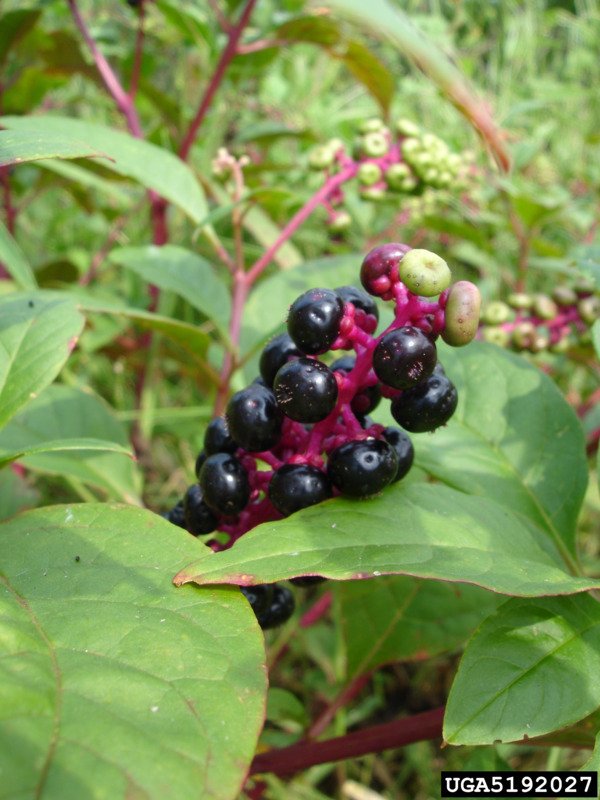 Pokeweed's most distinctive characteristic is showy purple-black berries which have been described as grape-like clusters (immature berries are green, turn white and then blackish purple). Large perennial shrub up to 2.5 metres. Deep purple – black berries form in summer and are the most distinctive characteristic. Large bright green leaves (up to 40cm long) on a smooth purplish stem. White to magenta flowers in elongated clusters that hang from the branches. Pokeweed is similar to inkweed (Phytolacca octandra), which is a widespread weed in the South West. Pokeweed is taller, has larger leaves, and the berry stalks hang down. Be aware of any new or unusual plants. Note the location of the plant (using a GPS if possible). DO NOT collect seeds, berries or leaves as they are all poisonous. Report to the Department of Primary Industries and Regional Development.